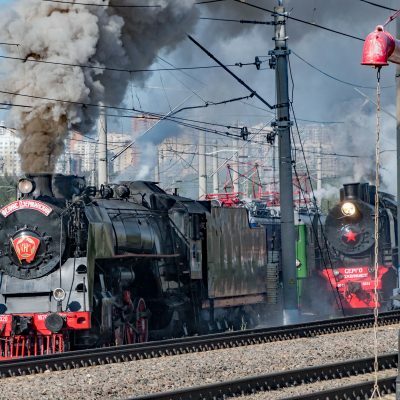 Russia’s biennial rail trade fair, EXPO1520, is a four-day event held at the end of August offering extensive exhibition halls, static exhibits, a thought-provoking conference and a dynamic exposition. It was first held in 2007, making this year’s show the sixth EXPO1520. Testing times The event is hosted by the Scherbinka research institute, 33km south of Moscow. This is one of six facilities run by the Russian rail research institute (VNIIZhT) which employs 1,700 people throughout Russia. It is six times the size of Derby’s Railway Technical Centre and has a circular test track of six-kilometre circumference, fitted with overhead catenary that can be energised at either 3kV DC or 25kV AC. Its test track was the world’s first and opened in 1932. It was electrified in 1935 and two further tracks were added in 1960. It has played a key role in the development of Russian rolling stock. In 1934, it was used to finalise the SA-3 automatic coupler design. Early diesel and electric locomotives were tested here, including a 20kV AC locomotive in 1940. Recently, the longitudinal forces in freight trains of up to 15,000 tonnes have been analysed and the test track has been used to test and certify modern traction. Russia’s infrastructure has also benefited from the testing of numerous sleepers, rails and fasteners as well as all aspects of traction supply, current collection and overhead line equipment. Currently, four different types of slab track have carried 600 million tonnes over a 22-month period as part of their testing at Scherbinka. Dynamic exposition If pushed, most railway engineers would admit that they have a little of the train spotter in them. Your writer is no exception. 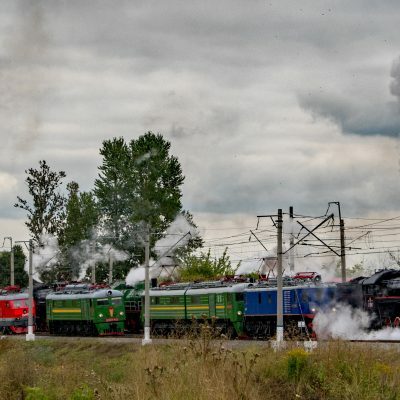 Hence, the highlight of the show is the twice-daily “dynamic exposition” in which two dozen Russian locomotives, old and new, are paraded before the crowds on the test track. 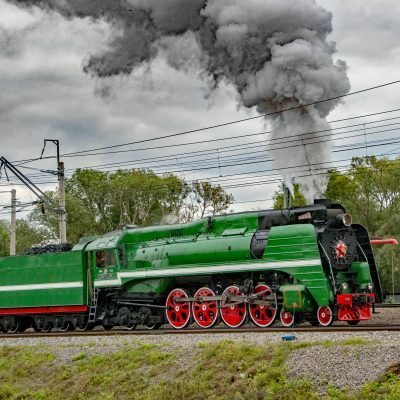 Many of the exposition’s steam locomotives owe their survival to being part of the Soviet Union’s strategic reserves during the cold war, when they were kept in a ready to steam condition. If this sounds odd, note that in World War 2, Soviet railways moved 2,500 factories to Siberia ahead of the German advance. 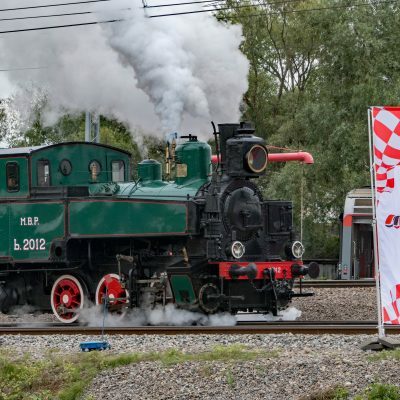 Some locomotives were restored after being displayed on plinths, as was the 1897-built class b-2012 0-6-0 tank locomotive which was on show for the first time at EXPO1520. In total, there were twelve preserved steam locomotives in the exposition. These included an E series 0-10-0 locomotive, introduced in the thirties, of which 10,670 were built, the world’s largest number of any type. Perhaps the most impressive machine was the 4-8-4 Class P36 steam locomotive, introduced in the 1950s for prestige passenger expresses. This weighed 133 tonnes, excluding its twelve-wheeled tender, and has a power output of 2,265kW. Next were six historic electric locomotives, of which the oldest was a class VL22 (VL for Vladimir Lenin and 22 denoting the axle weight). This 3kV DC locomotive was introduced in 1938 and has a power output of 2,400 kW. Others included the 4,650-kW Class VL60. Introduced in 1962, this was the first Soviet 25kV AC locomotive in large-scale production. 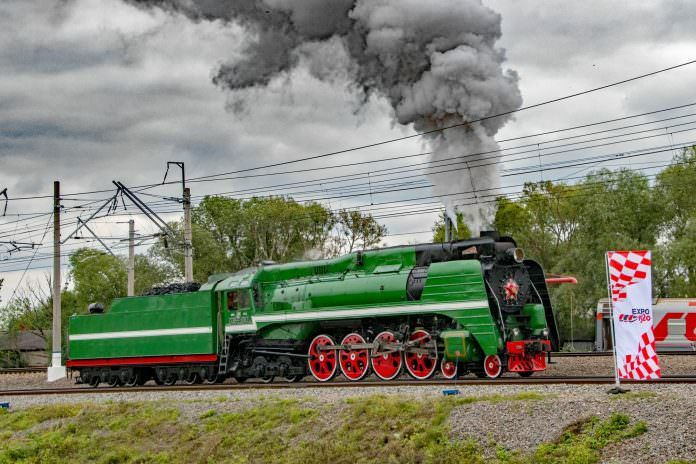 The last historic locomotive was the 1974 Czech-built 200 km/hr two-unit class ChS200 that had a power output of 8,400 kW and was used on Moscow to St Petersburg services prior to the introduction of high-speed Sapsan trains. Modern traction Russian Railways has a locomotive fleet of almost 13,000, of which around 7,900 are mainline locomotives (1,400 passenger, 6,500 freight). In recent times, about a billion pounds a year is spent procuring 500 locomotives to replace those from the Soviet era which are less efficient and less powerful. Siemens and Alstom have played a crucial role in the production of these modern locomotives. In 2010, Siemens entered a joint venture with the Sinara Group to create the Ural Locomotive Company (ULC). At the same time, Alstom entered into various collaboration agreements with Transmasholding (TMH) and now owns 33 per cent of the company. The products of these joint agreements also formed part of the dynamic exposition. 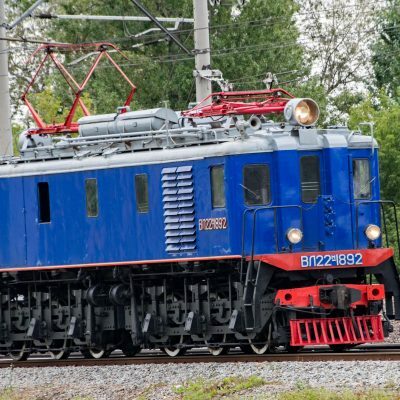 ULC’s 3ES10 “Granit” locomotive is a three-unit 3kV DC freight locomotive with a total power output of 12,600 kW. The introduction of this three-unit version enabled freight trains to be increased to 9,000 tonnes weight. The company’s 1,500 kW 180 tonne TEM7A diesel shunter has unusual eight-wheeled bogies, of which more later. TMH had its EP20, 4ES5K, TEM19 and 2TE25A locomotives on display. The EP20 is a 7,200kW dual-voltage passenger locomotive with a maximum speed of 200km/h and a Bo-Bo-Bo wheel arrangement. The 25kV AC four-unit 4ES5K “Ermak” locomotive has a total power output of 13,120kW, making it the world’s most powerful locomotive. Far less powerful is the 880kW TEM19 shunting locomotive, which has a piston engine and is powered by liquefied natural gas (LNG) stored in a cryogenic tank. The use of LNG instead of diesel is expected to reduce energy costs by 20 per cent. The 5,000kW two-unit Class 2TE25A was the only diesel locomotive in the exposition. Its introduction on the Baikal-Amur main line has enabled freight train weight to be increased from 4,900 tonnes to 5,600 tonnes. The static display included a 7,500 kW three-unit version (3TE25A). 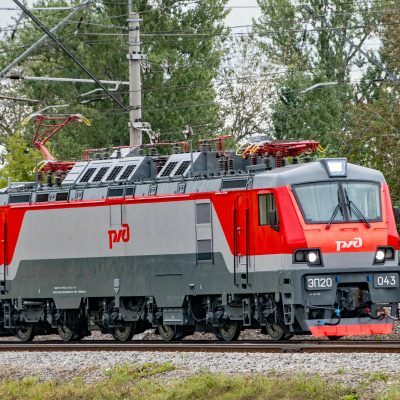 Bombardier’s entry into the Russia locomotive market was marked by the static display of the 2EV120 Knyaz (Prince) Vladimir locomotive, a joint venture with the First Locomotive Company (FLC). This dual-voltage, two-unit locomotive has a power output of 8,800kW and an option for a 500kW last-mile diesel engine. Its design is based on Bombardier’s Traxx and IORE locomotives, the latter hauling heavy iron ore trains in Sweden. The company has an order for an unspecified number of these locomotives, subject to their certification. Cooking with gas As part of its energy policy, Russian Railways requires some locomotives to be powered by LNG. Russia has an abundance of natural gas, which is both cheaper than diesel and has significantly less harmful emissions. Thus, in 2008, its VNIIZhT research arm produced a prototype 8,300kW LNG-powered gas turbine locomotive. After much trial use, a production version, the Class GTh1, was developed that could haul a 9,000-tonne train for 700km without refuelling. This was certified for use earlier this year. It is a two-unit locomotive with one unit housing the 20-tonne LNG tank and an 8,500kW gas turbine in the other. It weighs a hefty 368 tonnes and so requires 16 axles to give an acceptable 23-tonne axleweight. This is achieved by using eight-wheeled bogies like those on the TEM7A shunter – two double-axle bogies connected to the vehicle body by a spreader frame. Introduction of the TEM19 and GTh1 locomotives is in accordance with a 2016 agreement between Gazprom, Russian Railways, THM and Sinara Group. This requires Gazprom to both supply the gas and provide the locomotive fuelling infrastructure, Russian Railways to manage the introduction of these locomotives and their production by TMH (TEM19) and the Sinara Group (GTh1). 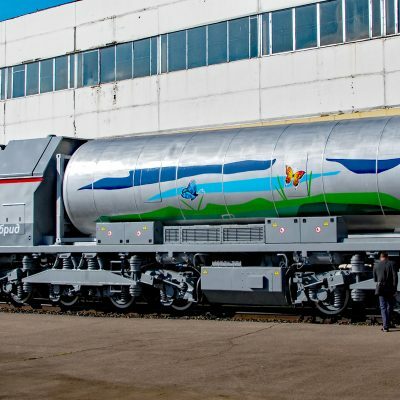 Sinara is reported to be building up to forty GTh1 mainline locomotives for use on Sverdlovsk railway, on which there is an LNG complex near Yekaterinburg. Carriages and wagons Other rolling stock featured in the static display included innovative passenger coaches and wagons. TMH developed its 3kV DC class EP2D EMU for use on lightly-used lines and offers a 20 per cent reduction in energy consumption compared to previous EMU designs. Originally produced by Siemens in Germany, the Lastochka (Swallow) is now manufactured in Russia with 90 per cent locally produced content. With 128 units now in service, Ural locomotives presented its premium version of this EMU, intended for inter-city journeys of up to 500km. For urban rail, TMH displayed its new-generation eight-car Moscow subway trains with walkthrough gangways, for which it has an order for 912 vehicles (114 trains). At peak load, capacity is 2,604 passengers, of whom 338 are seated. Stadler exhibited its three-car, low-floor Metelitsa tram. Its factory in Minsk, Belarus, is to build 23 of these trams for St Petersburg. Other coaches on display included a 66-tonne, 160km/h double-decker coach seating 104 passengers and a 48-tonne purpose-built postal wagon, both built by TMH. Over a million wagons operate on Russian Railways, many of outdated designs. With the drive for greater capacity and increased reliability, around 300,000 of these have been written off since 2012 to be replaced by a similar number of modern wagons. It is expected that Russian wagon production in 2017 will be about 40,000, a market worth £1.3 billion. EXPO1520 featured various innovative freight vehicles. The United Wagon Company showed an articulated container wagon that could carry up to 116 tonnes on six axles. RM Rail, meanwhile, demonstrated a hopper wagon which was the first in Russia to have an aluminium car body, reducing car body weight by 45 per cent and so increasing load capacity by 13 per cent to 79 tonnes. PTK Group presented its BCM 2000 ballast-cleaning machine that has two cutters and can operate at 750 metres per hour, which is claimed to be twice the normal speed. The machine could also be split into sections for local repairs. Two of Sinara’s track machines featured in the dynamic exposition. With side ploughs, its RP B-01 distributor planer has a grasp width of 6.7 metres and can operate at 6km/h. The PUMA multifunctional track machine incorporates a planer, tamper, working platform and Hiab crane. High-speed ultrasonic testing Moscow Metro’s diagnostic train is supplied by Infotrans, whose equipment is also used on Swiss and German railways. This coach monitors tunnel environmental conditions, communication systems including Wi-Fi, track circuit signal frequency and output, insulated joint condition, tunnel and platform gauge, rail and conductor rail geometry and cross-section, high-speed video monitoring of track components. Infotrans has also converted a 1970s’ ChS200 locomotive (a class shown in the dynamic exposition) into a comprehensive mainline infrastructure monitoring unit. This has all the Metro diagnostic train’s features plus catenary monitoring and ground radar to detect ballast problems such as wetbeds. In addition, the same company has also fitted an infrastructure-monitoring frame to a bogie on a high-speed Sapsan train. TVEMA also supplies infrastructure-monitoring coaches. Its offering includes high-speed ultrasonic rail testing at speeds up to 140km/h, which has now been successfully used on 10,000 miles of track. The system consists of two sleds, each with up to three probes, offering up to 18 ultrasonic channels per rail. The sleds have a contactless magnetic guidance system and use water as contact liquid. China and Europe The EXPO1520 conference also provided some interesting insights. Russia’s approach to the digital railway was as we reported from the recent 1520 forum (issue 155, September 2017). This included Siemens showcasing Thameslink as a good example. Guo Yang, head of CRRC’s high speed train project, described the development of high-speed rail in China where its 22,000-kilometre network has high-speed trains running at a maximum 350km/h in temperatures that range from minus to plus 40°C. By 2020, China plans to increase this network by a further 8,000km and have 45,000km of high-speed lines by 2030. She described how CRRC is developing sleeper, double decked and palletised cargo high-speed trains. For the proposed high-speed line between Moscow and Beijing, the company has designed gauge-changing trains for the transition between the Chinese standard gauge and Russian 1520mm gauge. With a co-operation agreement between China and Russia for the proposed Moscow to Kazan high-speed line in place, CRRC clearly sees itself as a likely supplier of trains for this line. Philippe Citroen is director general of UNIFE, which represents the European rail supply industry. He made it clear that Europe wants its share of Russia’s 12-billion-euro rail market, which is forecast to grow at 0.8 per cent per annum. To this end, he explained how UNIFE is pursuing discussions on regulations, standard and authorisation issues. For this British observer, it was ironic to hear him describe both the €1 billion Shift2Rail programme and the Trans-European transport network policy, which aim to reduce bottlenecks at borders. Dr Libor Lochman, executive director of the Community of European Railway and Infrastructure Companies (CER), echoed this view and described how the fourth European railway package will remove technical, administrative and legal obstacles impeding entry to railway markets. Edgar Keller, chief executive of ABB traction, gave an example of a European company responding to a market need. 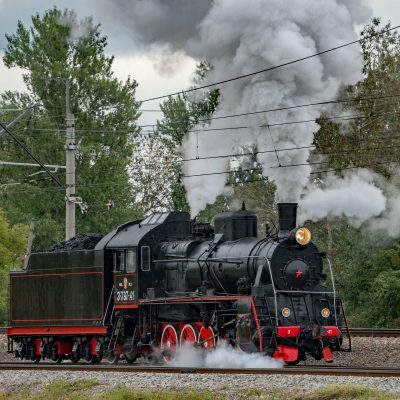 He explained the benefits of refitting mechanically strong locomotives with modern electrical equipment to reduce energy consumption and maintenance costs as well as increasing their reliability. As examples, he mentioned how replacing old thyristor converters with insulated-gate bipolar transistors (IGBT) had reduced the power consumption of German ICE1 trains by 15 per cent. ABB had undertaken similar electrical refits on 60 Indian locomotives and were currently refitting 101 Swiss class Re460 locomotives. Looking to the future One of the most interesting presentations was by Rudy De Waele of the Futures Agency on the future for transport engineering. This mirrored some of the issues raised at events such as the RIA innovation conference (issue 151, May 2017). Russian Railways clearly thinks that this is an important subject, as his presentation lasted for 45 minutes compared with the normal ten minutes or so. His presentation started with a quote from Bill Gates that “we always overestimate the change that will occur in the next two years and underestimate the change that will occur in the next ten” or, to put it another way, most change happens gradually then suddenly. Computing is one such example. The first computers were stand-alone, then they were networked and now they are part of the cloud which links billions of users. The next stage is ambient computing – billions of users, apps and sensors linked with effectively infinite network connections. Inevitably, this will result in a level of interconnectedness and interdependence that will lead to hyper-collaboration, rather than hyper-competition. It will also provide fully digitised business models and artificial intelligence that Rudy considers will become the “single most important thing in business”. With the rise in connected computing, data has become the new oil. Currently, the world’s three most valuable public companies are Apple, Alphabet (Google) and Microsoft, whereas ten years ago they were ExxonMobil, General Electric and Microsoft. Today, North America has data platform companies valued at over a billion dollars, Europe less than a quarter of this value whilst China is in between and catching up fast. After mechanisation, mass production and automation, the fourth cyber-physical industrial revolution has started. As a result, anything that can be digitised and automated will be and there will be “swarms of robots to build on each other’s learning experiences at lightning speed”. No longer science fiction If this sounds like science fiction, think how, in the 1979 film Alien, Sigourney Weaver defeated the creature with her manually operated robot. Such machines are now available in the form of robotic exoskeletons. Another technology that was in the realms of sci-fi is augmented reality, of which the Microsoft Hololens is an example. Rudy considers these technologies will fundamentally change the way companies operate. As an example, he cited 3D printing hubs, a global network of thousands of 3D printing companies that can produce parts within two days, that will transform manufacturing and inventory control. Railways have a promising future in the new technological revolution. One reason for this is increasing urbanisation that, by 2050, will have 75 per cent of the world’s population living in cities. However, to remain competitive, the industry needs to embrace new technologies. Rudy demonstrated this point by showing the video produced to illustrate the UK Rail Technical Strategy. He also stressed that travellers had to be provided with a seamless door-to-door experience and mentioned the concept of stations as destinations, giving St Pancras as an example. He ended his presentation with another quote, this time from Albert Einstein: “Computers are incredibly fast, accurate and stupid, whilst human beings are incredibly slow, inaccurate and brilliant. Together they are powerful beyond the imagination.” Lessons from Russia Everything in Russia is on a big scale. With 25,000 visitors and 8,000 square metres of exhibition space, EXPO1520 is no exception. Although Russian Railway’s operations are quite different to those in the UK, the show had much of interest for the UK rail industry. Whilst much of Russia’s railway modernisation is the result of technology transfer from Europe, the country has developed its own impressive railway technologies. As an example, Russia leads the world in the development of LNG-powered trains. This may not seem applicable to the UK, which will never see 9,000 tonne freight trains. Yet the TEM19 shunter shows how piston-engined rail vehicles can be powered by LNG, a more environmentally friendly fuel than diesel. Of more immediate interest are Russia’s rail infrastructure monitoring techniques, particularly high-speed ultrasonic testing. Both Russia and Britain face the same challenges of embracing future technologies. 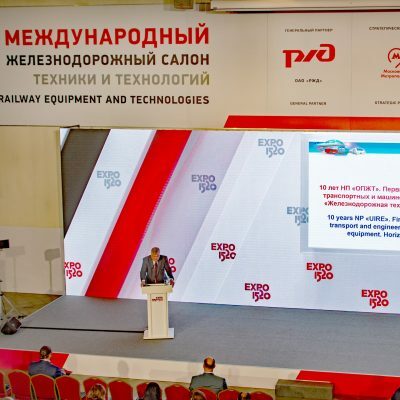 Whilst it was good to hear examples of UK practice quoted at EXPO1520, Russian Railways and its VNIIZhT research institute might also provide examples of best practice. Russia also offers a large rail export market. European rail companies have exported much to Russia and don’t seem to be constrained by sanctions. As indicated by the size and number of their stands in the exhibition halls, they wish to continue to do business with Russia. The Russian rail market is a difficult one to break into but, for a company with particularly innovative products, the 2019 EXPO1520 could be a good place to start.